If you were a ghost, where would your haunt be? As long as there isn't some rule tying spirits to the place of their departure or burial, the options for amusing hauntings are almost endless. That doesn't stop us from suggesting some of our favorites. For one, we'd love to haunt movie theaters. Any spirit could toss popcorn at couples that are getting too close or anyone using their cell phone and no one will ever know who the perpetrator was! Or if you're the spooking type you could take the classic piling furniture trick that poltergeists are so fond of to a whole new level at your local furniture store. Or you could just shack up at the nicest house in town and see how long it takes before someone turns it into a haunted bed and breakfast. Either way, once you're in the afterlife you might as well have fun with all the boos you've got! This black dress is the perfect Halloween look that can be taken from a spooky mid-morning brunch to a night at the club. It has long sleeves, perfect for the chilly autumn weather. 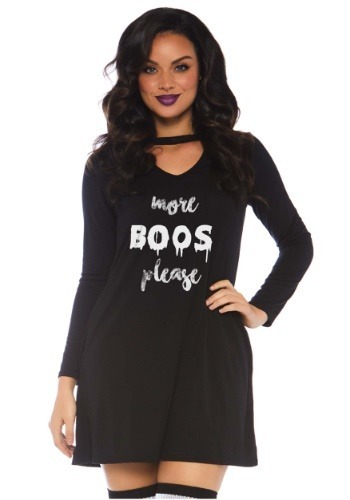 The neckline is fashionable and the text is the perfect blend of trendy and terrifying. While Halloween is known for its ghouls and goblins, let's be real, it's actually about having fun! The nice thing is, Halloween season starts on October first so you'll have plenty of time to style this dress in a variety ways. Layer it up or wear it solo. No matter how you wear it, people are sure to know that your priorities lie with the spirit of Halloween!